FACT: According to the USPS 70% - 90% of new move-ins are families new to the area. Not only are new families looking for a new pizza place, dry cleaners and grocery store, many families may be actively looking for a new church home. 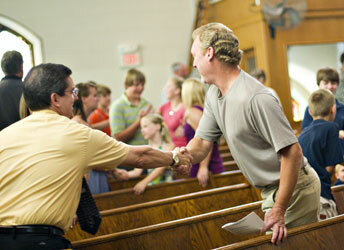 Families new to the area are a prime outreach audience for your church. Getting connected is very important to new movers. They are more likely to actively seek out a new church home. They may be making inquiries with neighbors, looking at church websites or asking friends and families. They will be focused on what comes in the mail. A well crafted direct mail piece from a local church is the ideal medium to spread a message of welcome and invitation. Of this group, people in their 20s represent the highest concentration. Once people reach their 50s, their move rate slows dramatically. Young families, many with children, are prime prospects for any church outreach program. FACT: New Mover Direct Mail is INEXPENSIVE! Reaching new families is inexpensive. Many churches invest less than $40 a month. We also know that an entire new mover church marketing program will quickly pay for itself with only a handful of new church members. What's more, once a new mover program has been set-up, it runs on auto-pilot. You decide where to mail and how much to spend.